Samsung Galaxy S9 will have Super Speed Dual Pixel 12MP OIS (f/1.5 / f/2.4) camera! Home / leaks / mobile / samsung / Samsung Galaxy S9 will have Super Speed Dual Pixel 12MP OIS (f/1.5 / f/2.4) camera! Just in! An alleged leak of the upcoming Samsung Galaxy S9 retail box revealed some of its possible key specs. According to the leak, the Samsung Galaxy S9 will feature a couple of interesting addition. The said handset could have a Super Speed Dual Pixel 12MP OIS (f/1.5 / f/2.4) single camera! It means that Samsung will implement a variable aperture setup like the Samsung W2018. In addition, the handset is said to have a Super Slow-mo mode with possible up to 1000 fps shooting ability. On the other hand, the Samsung Galaxy S9 will finally have a stereo speaker setup tuned by AKG audio. Moreover, it will have an Iris Scanner for face unlocking. 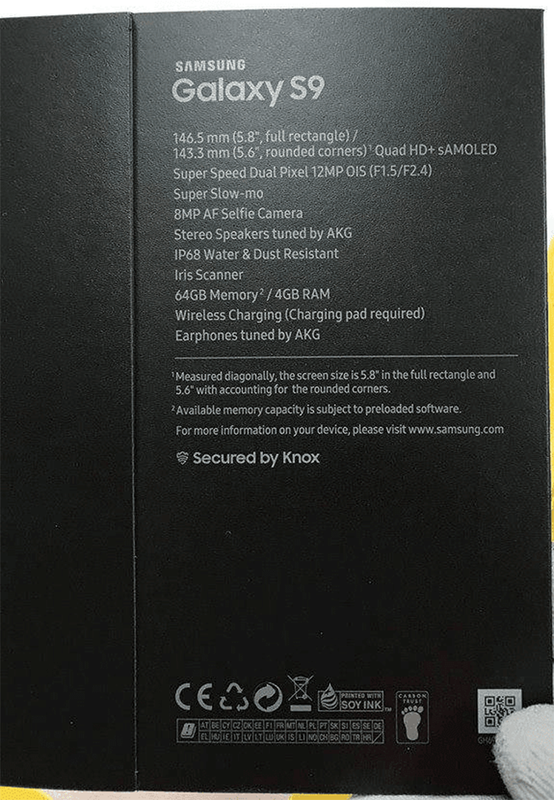 Other specs indicated in the alleged leaked box includes an 5.8-inch QHD+ screen with 2960 x 1440 resolutionl 4GB RAM, 64GB internal storage, 8MP selfie camera w/ AF, wireless charging, IP68 water and dust resistance, iris scanner, and AKG earphones in the package. The Samsung Galaxy S9 is coming next month at MWC 2018!